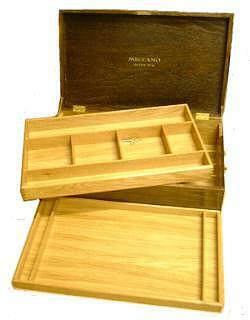 Constructed from oak and oak faced plywood by a professional cabinet maker. With lift up locking lid, two partitioned lift out trays, partitions to chest floor, brass handles and correct decals. Constructed from mahogny veneered plywood by a professional cabinet maker. With 3 unpartitioned drawers for maximum storage. The shade of finish may vary from the illustration. Constructed from mahogany faced plywood by a professional cabinet maker. With 4 partitioned drawers and correct decals. Size: 605mm wide x 395mm deep x 286mm high. As applied to "L" Set chest. Self Adhesive "Meccano" & Outfit10"